Citizenship is at the heart of our contemporary world but it is a particular vision of national citizenship forged in the French Revolution. 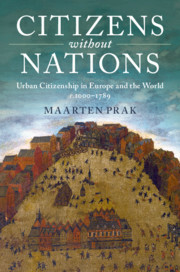 In Citizens without Nations, Maarten Prak recovers the much longer tradition of urban citizenship across the medieval and early modern world. Ranging from Europe and the American colonies to China and the Middle East, he reveals how the role of 'ordinary people' in urban politics has been systematically underestimated and how civic institutions such as neighbourhood associations, craft guilds, confraternities and civic militias helped shape local and state politics. By destroying this local form of citizenship, the French Revolution initially made Europe less, rather than more democratic. Understanding citizenship's longer-term history allows us to change the way we conceive of its future, rethink what it is that makes some societies more successful than others, and whether there are fundamental differences between European and non-European societies.